Lagos is a vibrant mix. Many people regard themselves as Lagosian. Some are Lagosians by birth, others by naturalisation. To be truthful, some are Lagosians merely by association. One sympathises with this struggle to acquire the ‘cool factor’ in being termed a Lagos boy or more colloquially, a ‘Gidi girl’. However, these Lagosians don’t have a single Lagos experience. Some of the Lagosians who reside in the Lekki/Ikoyi axis have a conception of Lagos that begins and ends on ‘the island.’ Some of these ones never venture beyond the Third Mainland Bridge except to catch international flights at the airport in Ikeja, of course. Some of those who reside on the Mainland will argue that they are the true Lagosians. Lagos is a different reality in Ajegunle than it is in Ikoyi. Despite these dissimilarities, we all sing along when Olamide’s ‘Lagos boys’ comes up on the radio. We all claim ownership of that tag whether we are local in Makoko, or in Banana Island. This begs the question, what connects us? How can we be similarly defined (Lagosian) when our experiences of Lagos are so varied? Lagos goes beyond the geography of the place. When people passionately describe their love for Lagos, they are not being dutifully patriotic. They have been possessed by the Lagos feel. Lagos goes beyond the geography of the place, Lagos is a feeling. For this reason, those who appreciate Lagos and swear exclusive residence to this city, both now and forever, are not speaking of traffic jams or notorious pick-pockets. No. They have encountered the Lagos feeling – an interminable high. If Lagos is a feeling, the stimulant is the people. 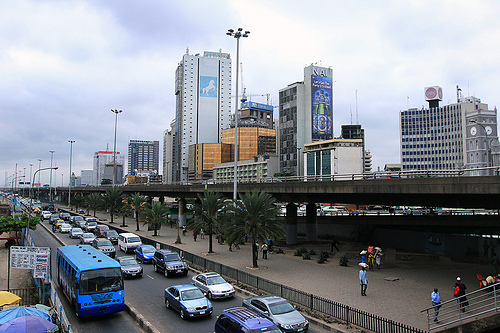 Lagos is unique in Nigeria because it is a melting pot. The people who make up Lagos include the original Omo-Ekos – the natives, to those – like me, who packed their bags from the rural hinterlands of Nigeria and West Africa in search of the Golden Fleece. These ones do not only hustle in the unforgiving Lagos traffic – sometimes literally, they contribute to the soul of Lagos. What then is this soul? In Pidgin English, it is often said that: “… I no come Lagos to count bridge,” in essence, one cannot afford to be indolent in Lagos. I have often explained to non-Lagosian friends that Lagos pulls me because there is a beat to the city. A beat of hustle and drive – you must dance to this beat in Lagos, otherwise, you shall be depressed in your lack of achievement. This is the soul of Lagos. For the lazy and unimaginative, this is a hard and unforgiving city. To the innovative and assiduous, Eko bears fruits. For these ones, nowhere else will do. But Lagos is a mess. Although many Lagosians will fiercely argue why they could not live anywhere else but Lagos, Lagos living remains quite challenging. The traffic jams are hellish. 15 minute journeys can easily become 3 hour journeys in Lagos. This is normal here. Additionally, your best Mercedes Benz saloon car soon becomes a mere compound accessory, as several roads are too pot-holed for the car’s low base. Although the night scene is often extolled, there is the very real fear of armed robbers or kidnappers while driving home. These bandits are often so skilled that a call to the police might be a waste of your time. Here, the police are supposed to be our friends, but the average Lagosian surely has a story of harassment at the hands of these ‘public servants’. You see, although the Lagos feeling is great, Lagos litters your path with its own brand of ‘Lagos living hazards’ as detailed above. So what is the Lagos pull? To many Lagosians, Lagos is Nigeria’s answer to New York. But the reality shows us the comicality of this comparison. How else will one explain the long queues that decorate the various foreign embassies in Ikoyi every morning – queues which take shape even before the crack of dawn? You see, Lagos could be New York, but we should not be crucified for pointing out that this city is a long way from there. We are in denial when we ascribe utopia to Lagos. Fine, we have a vision of what Lagos could be, what we might like Lagos to be, but the reality is otherwise. When we describe Lagos without its flaws, we are actually bullying the reality of Lagos to fit within our imaginative vision. This is one way of dealing with the matter, but is it an effective method? With the petrodollars flowing into Lagos, coupled with the innovative and can do attitude of Lagosians, this city has the potential to be the greatest in the world. It deserves more than rhetoric that hides the issues which we should deal with to upgrade the city. For Lagos to unshackle itself from perennial underperformance and despicable stereotypes, let us – those who call Lagos home – be creative. Imagine if we spent our energies implementing positive changes in our own communities? Not all the problems in our communities require top down intervention. For example, in the neglected Makoko slum in Lagos, Kunle Adeyemi was able to identify the need for education in that community and inspire the idea for the Makoko floating school – a functional solution and a remarkable feat of architecture, if I might add.